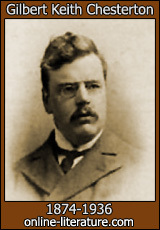 Ah, Chesterton, witty Christian sage! Here he expounds again on his favorite subject: how the unspiritual man blinds himself to the magnificent glories of God’s creation. In this poem, we appear to have a narrator utterly besotted with his Lady fair; and yet not so besotted as to worship her at the exclusion of the God who created her. On the contrary, the splendor of the Lady’s beauty calls his attention to all the other splendors God has made. The Lady wears gray, he exults in gray spires, gray morning skies, and the gray hairs that mark the wisdom and honor of old age. She wears green, and every grass and tree seems to shine like an emerald. She wears blue, and he is awed and grateful at the Creator’s artistry in using that same color for the sky. My friends, I have only just discovered this poem, but it grows increasingly beautiful to me as I reflect on it. 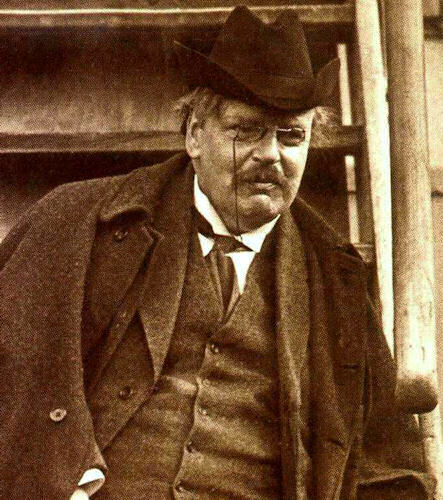 What Chesterton has given us is a picture of how the romantic love between a godly man and woman will of its own accord, and quite naturally, magnify their own love for God. And since their love for each other comes from God Himself, well, you see what a wonderful, eternal cycle this is. And yet this cycle of love, joy, and beauty, is not enjoyed by all. The “evil sage” at the end—I guess that Chesterton is hinting at scholars and intelligentsia who care not to think of God—looks at the world, and sees only a bubble, not even then noting the colorful beauty of bubbles themselves! ‘God keep you in your weary wit! Source: The Wild Knight and Other Poems by G.K. Chesterton, courtesy of Project Gutenberg. Our dear friend Gilbert Keith is back again! Finding various poems of his online was a treat, and this particular one spoke to me the most. In it, the narrator, a native of fairyland, returns to his home to find it overtaken by industry and modernity. It’s a horrible, heartbreaking sight. The trees, I gather, replaced with smokestacks, and all God’s creatures sick and wretched from it all. But out traveler loves his home, and knows it better than others. What does he see, what can he hear? Is there any hope for a world fallen from grace and overwhelmed by filth? My friend and I were walking in one of those wastes of pine-wood which make inland seas of solitude in every part of Western Europe; which have the true terror of a desert, since they are uniform, and so one may lose one’s way in them. Stiff, straight, and similar, stood up all around us the pines of the wood, like the pikes of a silent mutiny. There is a truth in talking of the variety of Nature; but I think that Nature often shows her chief strangeness in her sameness. There is weird rhythm in this very repetition; it is as if the earth were resolved to repeat a single shape until the shape shall turn terrible. But for the beautiful experiment of lying in bed I might never have discovered it. For years I have been looking for some blank spaces in a modern house to draw on. Paper is much too small for any really allegorical design; as Cyrano de Bergerac says, “Il me faut des géants.” But when I tried to find these fine clear spaces in the modern rooms such as we all live in I was continually disappointed. I found an endless pattern and complication of small objects hung like a curtain of fine links between me and my desire. I examined the walls; I found them to my surprise to be already covered with wallpaper, and I found the wallpaper to be already covered with uninteresting images, all bearing a ridiculous resemblance to each other. I could not understand why one arbitrary symbol (a symbol apparently entirely devoid of any religious or philosophical significance) should thus be sprinkled all over my nice walls like a sort of small-pox. The Bible must be referring to wallpapers, I think, when it says, “Use not vain repetitions, as the Gentiles do.” I found the Turkey carpet a mass of unmeaning colours, rather like the Turkish Empire, or like the sweetmeat called Turkish Delight. I do not exactly know what Turkish Delight really is; but I suppose it is Macedonian Massacres. Everywhere that I went forlornly, with my pencil or my paint brush, I found that others had unaccountably been before me, spoiling the walls, the curtains, and the furniture with their childish and barbaric designs. Nowhere did I find a really clear space for sketching until this occasion when I prolonged beyond the proper limit the process of lying on my back in bed. Then the light of that white heaven broke upon my vision, that breadth of mere white which is indeed almost the definition of Paradise, since it means purity and also means freedom. But alas! like all heavens, now that it is seen it is found to be unattainable; it looks more austere and more distant than the blue sky outside the window. For my proposal to paint on it with the bristly end of a broom has been discouraged–never mind by whom; by a person debarred from all political rights–and even my minor proposal to put the other end of the broom into the kitchen fire and turn it to charcoal has not been conceded. Yet I am certain that it was from persons in my position that all the original inspiration came for covering the ceilings of palaces and cathedrals with a riot of fallen angels or victorious gods. I am sure that it was only because Michael Angelo was engaged in the ancient and honourable occupation of lying in bed that he ever realized how the roof of the Sistine Chapel might be made into an awful imitation of a divine drama that could only be acted in the heavens. The tone now commonly taken toward the practice of lying in bed is hypocritical and unhealthy. Of all the marks of modernity that seem to mean a kind of decadence, there is none more menacing and dangerous than the exultation of very small and secondary matters of conduct at the expense of very great and primary ones, at the expense of eternal ties and tragic human morality. If there is one thing worse than the modern weakening of major morals, it is the modern strengthening of minor morals. Thus it is considered more withering to accuse a man of bad taste than of bad ethics. Cleanliness is not next to godliness nowadays, for cleanliness is made essential and godliness is regarded as an offence. A playwright can attack the institution of marriage so long as he does not misrepresent the manners of society, and I have met Ibsenite pessimists who thought it wrong to take beer but right to take prussic acid. Especially this is so in matters of hygiene; notably such matters as lying in bed. Instead of being regarded, as it ought to be, as a matter of personal convenience and adjustment, it has come to be regarded by many as if it were a part of essential morals to get up early in the morning. It is upon the whole part of practical wisdom; but there is nothing good about it or bad about its opposite. Misers get up early in the morning; and burglars, I am informed, get up the night before. It is the great peril of our society that all its mechanisms may grow more fixed while its spirit grows more fickle. A man’s minor actions and arrangements ought to be free, flexible, creative; the things that should be unchangeable are his principles, his ideals. But with us the reverse is true; our views change constantly; but our lunch does not change. Now, I should like men to have strong and rooted conceptions, but as for their lunch, let them have it sometimes in the garden, sometimes in bed, sometimes on the roof, sometimes in the top of a tree. Let them argue from the same first principles, but let them do it in a bed, or a boat, or a balloon. This alarming growth of good habits really means a too great emphasis on those virtues which mere custom can ensure, it means too little emphasis on those virtues which custom can never quite ensure, sudden and splendid virtues of inspired pity or of inspired candour. If ever that abrupt appeal is made to us we may fail. A man can get use to getting up at five o’clock in the morning. A man cannot very well get used to being burnt for his opinions; the first experiment is commonly fatal. Let us pay a little more attention to these possibilities of the heroic and unexpected. I dare say that when I get out of this bed I shall do some deed of an almost terrible virtue. For those who study the great art of lying in bed there is one emphatic caution to be added. Even for those who can do their work in bed (like journalists), still more for those whose work cannot be done in bed (as, for example, the professional harpooners of whales), it is obvious that the indulgence must be very occasional. But that is not the caution I mean. The caution is this: if you do lie in bed, be sure you do it without any reason or justification at all. I do not speak, of course, of the seriously sick. But if a healthy man lies in bed, let him do it without a rag of excuse; then he will get up a healthy man. If he does it for some secondary hygienic reason, if he has some scientific explanation, he may get up a hypochondriac. That's the Snow Queen on the front, looking for all the world like the White Witch. 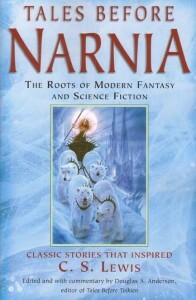 Reason for Beginning: Lewis is one of my “literary mentors,” as it were, in both fantasy and philosophy, and I love exploring the things that inspired him. Reason for Finishing: It’s a wonderful collection! And some of the stories are now among my favorites. Spoiler-free Synopsis: A collection of tales that inspired C.S. Lewis or shared similar themes/ideas with his works. My Tigana review shall be coming shortly, and before it does shall come a review of G.K. Chesterton’s “The Coloured Lands”. To shed light on that review, I am featuring here an excerpt from Chesterton’s essay “The Artistic Side,” in which he ruminates on the startling beauty of colors, and what that might mean. I think what he says is important not just in the genres of fantasy and fiction, but for the way we look at life in general. “I know no better exercise in that art of wonder, which is the life of man and the beginning of the praise of God, than to travel in a train through a long dark almost uninterrupted tunnel: until the traveller has grown almost accustomed to dusk and a dead blank background of brick. At last, after long stretches and at long intervals, the wall will suddenly break in two, and give a glowing glimpse of the land of the living. It may be a chasm of daylight showing a bright and busy street. It may be a similar flash of light on a long lonely road of poplars, with a solitary human figure plodding across the vast countryside. I know not which of the two gives a more startling stab of human vitality. Sometimes the grey facade is broken by the lighted windows of a house, almost overhanging the railway-line; and for an instant we look deep into a domestic interior; chamber within chamber of a glowing and coloured human home. That is the way in which objects ought to be seen; separate; illuminated; and above all, contrasted against blank night or bare walls; as indeed these living creations do stand eternally contrasted with the colourless chaos out of which they came. Travelling in this fashion, the other day, I was continually haunted, and almost tormented, with an impression that I could not disentangle; nor am I at all confident that I can disentangle it here.